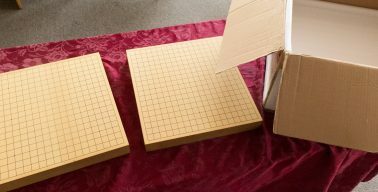 These Go boards were refinished and relined in Tokyo, Japan, by the firm of Hirai Gobanten, with shipping kindly arranged by the Overseas Department of the Nihon Ki-in. They are our original yellow cedar (yellow cypress) table boards, which we have been using for 21 years. 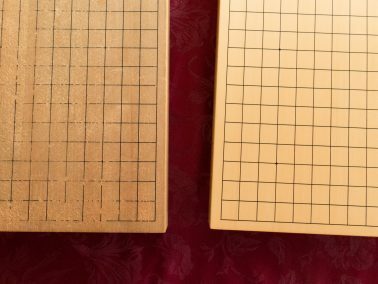 This is a better wood for Go than the new “shin kaya” boards that are currently available. Before refinishing and relining, and after (different boards). We are hoping to reline most of our 2″ table boards. Sixteen more of them are quite worn. (We play a lot of Go here.) The cost will be about $180 per board, including shipping to and from Japan. Given the quality of our yellow cedar boards, we feel that this renewal is well worth the expense. Our third batch, with six boards, went to Japan in late March, 2017. We have enough donations and pledges to pay for all 19 boards. Thanks to the membership for their support! Donors who gave us $180 or more may sign the back of one of our renewed boards in the center. Donors who gave us $50 or more may sign the back of one of our renewed boards in the corner. March 2018: Board Refinishing Complete! Our last batch of three boards is back from Japan. We did not send one board, because it is developing a crack. So the project renewed 18 boards total. 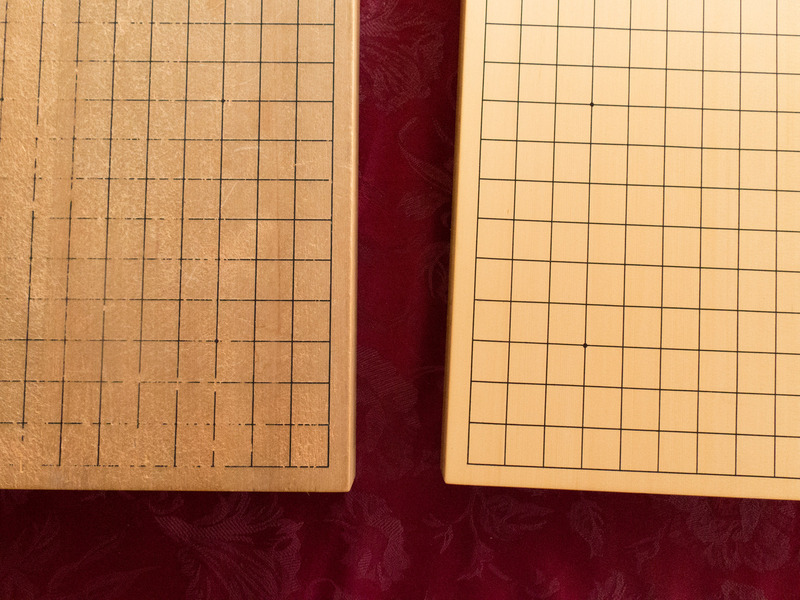 The last batch was delayed a bit because the same shop was refinishing 120 boards for the Nihon Ki-in!